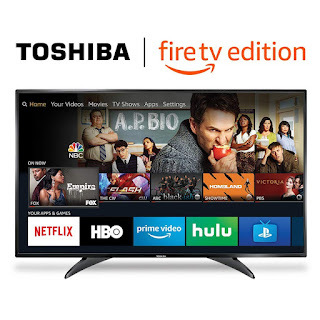 Head over to get this Toshiba 32LF221U19 32-inch 720p HD Smart LED TV - Fire TV Edition for ONLY $129.99 (Retail $180)! Toshiba HD Smart TV is a new generation of television featuring the Fire TV experience built-in and including a Voice Remote with Alexa. Toshiba delivers a superior TV experience that gets smarter everyday and access to all the movies and TV shows you love. The Voice Remote with Alexa lets you do everything you'd expect from a remote—plus, easily launch apps, search for titles, play music, switch inputs, control smart home devices, and more, using just your voice. Smart but simple in every way. Just plug it in, connect to Wi-Fi, and enjoy.